We’d love your help. Let us know what’s wrong with this preview of Revolutionary Mothering by Alexis Pauline Gumbs. 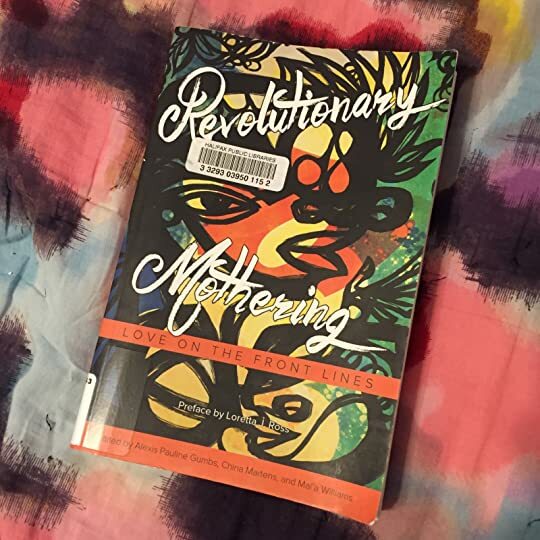 To ask other readers questions about Revolutionary Mothering, please sign up. I can't overstate the importance of parenting narratives that push back against the white supremacist capitalist cishet nuclear family norm & I can't overstate my gratitude and debt to women of colour and their insistence on the inclusion of mothering as power, liberation, and radical activism. And also, I wish there had been more than one trans woman in this book, and I was hoping for some perspectives that integrated a powerful comprehension of mothering as divine with something other than I can't overstate the importance of parenting narratives that push back against the white supremacist capitalist cishet nuclear family norm & I can't overstate my gratitude and debt to women of colour and their insistence on the inclusion of mothering as power, liberation, and radical activism. This book speaks to my heart. Several times I found myself with tears in my eyes, not because of how sad it was but because of how true it was. This was a library book but I hope to soon own this book and consult it regularly. As someone who is currently crafting her own plan for future revolutionary/fugitive mothering endeavors, reading this anthology was an extreme delight. It was heartfelt, searing in its truths and critiques of systems of oppression, and endearing with the personal antidotes about everyday parenting maneuvers. As a black queer Muslim, I tend to be severely ambivalent about raising children and/or starting my own family given the current states of oppression. Yet I feel better knowing there are oth As someone who is currently crafting her own plan for future revolutionary/fugitive mothering endeavors, reading this anthology was an extreme delight. It was heartfelt, searing in its truths and critiques of systems of oppression, and endearing with the personal antidotes about everyday parenting maneuvers. As a black queer Muslim, I tend to be severely ambivalent about raising children and/or starting my own family given the current states of oppression. Yet I feel better knowing there are other parents out there intent on family creation as an act of resistance. "mothering is love by any means necessary"
I devoured this book. I know I’ll return to it over and over again. This is an anthology of different accounts of mothering from a wide range of people. Lots of diversity on several different levels. I'm so thankful to the editors and the contributors to this wonderful piece of work. I have been reading fiction for the past year, so it took a few pages for me to get into the writing. I loved reading stories about mothering that were written by a diverse group of women at different stages of their lives. I don't want to include any spoilers in this review, but I will say that each story in this anthology illustrated the strength, vulnerability, and the necessity of revolutionary mothering. I h I'm so thankful to the editors and the contributors to this wonderful piece of work. I have been reading fiction for the past year, so it took a few pages for me to get into the writing. I loved reading stories about mothering that were written by a diverse group of women at different stages of their lives. I don't want to include any spoilers in this review, but I will say that each story in this anthology illustrated the strength, vulnerability, and the necessity of revolutionary mothering. I have to say that my respect for women and transwomen who mother in difficult circumstances has grown as a result of reading this work. I also feel even more grateful for the women who have mothered me in addition to my biological mother. Revolutionary Mothering is an anthology comprised of essays and poems by radical, revolutionary mothers. The voices in this book are the voices that are so often ignored in mainstream conversations about motherhood: queer and trans mamas, mamas of color, single moms, poor mothers, young mothers. Inspired by This Bridge Called My Back, a collection of essays by radical women of color, published in 1981 and now a classic feminist text, Revolutionary Mothering is similar in tone and substance. 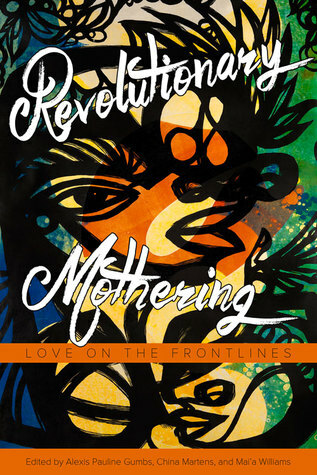 The e Revolutionary Mothering is an anthology comprised of essays and poems by radical, revolutionary mothers. The voices in this book are the voices that are so often ignored in mainstream conversations about motherhood: queer and trans mamas, mamas of color, single moms, poor mothers, young mothers. Inspired by This Bridge Called My Back, a collection of essays by radical women of color, published in 1981 and now a classic feminist text, Revolutionary Mothering is similar in tone and substance. The essays range from the academic to the personal. Some read like memoir, others are mostly feminist/radical analysis, and some lie more in the realm of manifesto. While this was absolutely a worthwhile read, I found many of the pieces too vague or too short. I felt many of the contributions lacked a narrative arc, central theme, or organizing structure. I understood the importance of what these women had to say, but found it hard to connect to on a gut level. At times, the writing felt dry and vague; instead of sinking into the stories of radical motherhood, reading it felt more like being at a university lecture. That said, I still think this book is absolutely worth reading. It brilliantly busts open all gatekeepers of motherhood, the idea that being a mother means being white, finically stable, straight, partnered, biologically related to your child. We so often put mothers on a pedestal, and when people dare to live whole, complicated, imperfect lives, lives that include parenthood, we chastise them for not doing it right, for not being perfect parents, for being poor or single or queer or living in the wrong neighborhood. The women who contributed to this anthology represent a beautiful diversity of ways to be a mother. Their experiences are not the same, but they all share a commitment to motherhood as a radical action. These are mothers who have built all kinds of non-biological family, who have given birth or chosen not to, who are poor, who had children as teenagers, who love their children deeply, and who struggle with how parenthood redefines and rearrange a life. They write about the deep joy they’ve experienced as mothers as well as the injustices they’ve faced as people of color, queer people, and mothers who don’t fit the mainstream mold. They write about motherhood as being revolutionary, about the various ways mothering is part of a larger struggle for justice, about the importance of nurturing, of raising children in activist communities, of building movements that include parents and children. I recommend it to anyone interested in expanding their ideas about motherhood and what it means–not just for parents, but for all of us humans. There are so many great things to say about this book. A great introduction to intersectionality. By reading all those stories, manifesto and poems by women from minorities, you cannot help but feel this radicality of being a mom. How political and yet natural it is to bring a child to this world and to do your best. May you be on the front lines of activism, plagued with chronic pain, or undermined because of the colour of your skin, your love partners or the gender to associate to, in the end, There are so many great things to say about this book. A great introduction to intersectionality. By reading all those stories, manifesto and poems by women from minorities, you cannot help but feel this radicality of being a mom. How political and yet natural it is to bring a child to this world and to do your best. May you be on the front lines of activism, plagued with chronic pain, or undermined because of the colour of your skin, your love partners or the gender to associate to, in the end, mothering is love. Radical love. Revolutionary love. I said it before, but even more after this book, but becoming a mother, matrescence, means a revolution. It only makes sense for mothering to be revolutionary. At that the end seek by this revolution is love. My copy is heavily altered by lines, stars and hearts that I wrote in the margins. I want to go back to this book from time to time. Some pieces resonated more with me, of course. And indeed, from my privileged position in society, I cannot phantom what many of those writers have gone through. But I get them better, which was the goal of this book. Personal is political. "Mothering is love by any means necessary." 4.5 but I will ALWAYS round up for Alexis Pauline Gumbs and anyone that she gathers for an anthology. This was the book that I chose to read right after a more mainstream book on expecting and mothering because I needed a dose of revolutionary mother love. Of course I read this book! I know the editors and it's a topic close to my heart. Plus I have one story in here. Strongly recommend! Pretty powerful stuff. Thanks to Jess for the loan! "I am not free while any woman is unfree, even when her shackles are very different from my own." Not what I was expecting when this book was recommended to me, but I got a lot out of this and am grateful for having had the opportunity to read this book. Can't say enough wonderful things about it! Wide-ranging in theme and writing types, inspiring. Useful for teaching (e.g. "Mothering as Revolutionary Praxis" by Cynthia Dewi Oka). Particularly timely as we watch (brown) mothers being deported . . .
One of my favorite books. A collection of many powerful perspectives on Mothering. Some I could relate to and some I could not but I appreciated them all for their sharing of truth. The importance of intersectionality in feminism cannot be overstated, especially when the subject is that of motherhood. I have always made a point to include feminist works by non-white, non-cis gendered, non-straight women so that I don't develop tunnel vision when it comes to women who have experienced life as a woman differently from the way I have experienced it. Being white and m "I am not free while any woman is unfree, even when her shackles are very different from my own." The importance of intersectionality in feminism cannot be overstated, especially when the subject is that of motherhood. I have always made a point to include feminist works by non-white, non-cis gendered, non-straight women so that I don't develop tunnel vision when it comes to women who have experienced life as a woman differently from the way I have experienced it. Being white and middle class, I have privileges that other women don't enjoy. It would be irresponsible to assume we all have the same battle to fight. I work as an attorney representing women in juvenile court whose children have been removed by DHS for alleged abuse or neglect. My clients are marginalized in different ways - some because they are not white, some because they are gay, because they don't speak English, because they come from a different cultural background, a different religion, a different upbringing or educational background. But all of them are marginalized because they are poor. If we intend to free all women from the weight of patriarchy, we cannot ignore the women at the margins. We can't say "First, we'll free the white women, then the white women can free everyone else once they have power." We have to rise together or not at all. The value of a book like this cannot be described because it acts as a bridge between those of us with privilege and those of us without. The contents of the book have varying degrees of enjoyment, and obviously I enjoyed some more than others, but they all had value. I have been passing this around to my fellow feminists who are also raising revolutionaries, and I strongly believe that no feminist bookshelf should be without it. Definitely required reading. One of the best books that I have ever read. It offers a truly revolutionary vision for a world of compassion and freedom. It is invaluable and deserves to be widely read. Alexis Pauline Gumbs is a poet, independent scholar, and activist. She is author of Spill: Scenes of Black Feminist Fugitivity and coeditor of Revolutionary Mothering: Love on the Front Lines and the Founder and Director of Eternal Summer of the Black Feminist Mind, an educational program based in Durham, North Carolina.